Under the cheers of their team-mates and new found friends among the other young European Samaritans, the participants held up their trophies and winner's certificates. Prizes were awarded for the best teams from each of the two age groups as well as for the individual best scores in each age group. Mr. Reuter and the present members of the SAM.I.-Presidium also took the opportunity to thank all the local organisations and municipal authorities who supported the Contest and welcomed the young Samaritans to Adria and Venice. The award ceremony on Saturday night marked the grand finale of three days of tasks which the participants had to compete in under the sunny sky of Adria and Venice. The Contest started out on Thursday, August 7 with the creative task, in which the young Samaritans had to carry out a short stage play following the motto of the SAM.I. Year of Youth Engaged in First Aid: Heroes without superpowers. The best performance, by decision of the audience, was given by the teams from the host organisation ANPAS, Italy and from LSA, Latvia. On the second day, the theoretical knowledge in first aid was tested with a written exam. 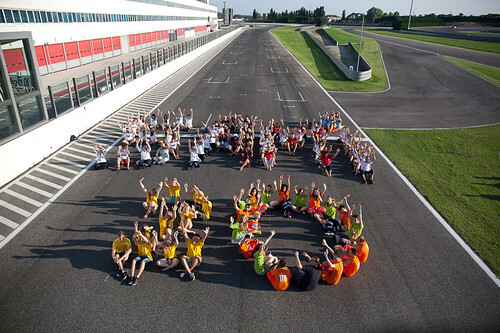 The participants then went on to compete in dexterity tasks which, fitting the location of the Adria International Raceway, were held in the form of a relay race. In the evening, the participants were welcomed in Adria, to the city's summer celebrations, where they held a parade of volunteers through the centre. 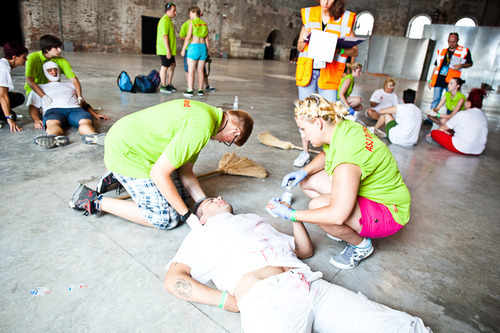 The centrepiece of the contest was held on Saturday, when the participants went to the city of Venice to practically test their skills in first aid. 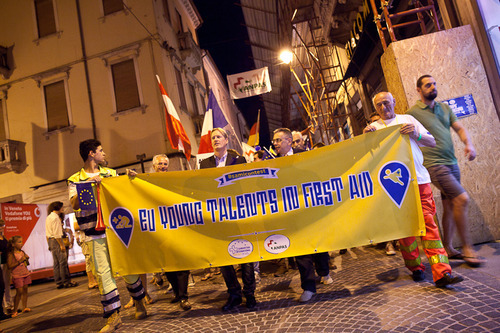 At four stations distributed across the historic city, ANPAS volunteers had set up stations with different emergency scenarios, to which the youth groups had to react. Not only their factual knowledge of first aid was challenged, but also their ability to adapt to situations beyond text-book knowledge. Sometimes they had to calm panicking bystanders or handle the fact that some of the people they had to aid were deaf-mute, posing an extra challenge in communication with the patient. The latter aspect was specifically included to make the young first-aiders aware of the special needs that arise when people with disabilities find themselves in an emergency situation. The event was also used as an occasion to commemorate the 20th anniversary of SAMARITAN INTERNATIONAL. Our network was founded in August 1994 by ASB Germany, ASB Austria, DKFH, Denmark and CB, France and has since grown to encompass 16 organisations in 15 countries with a total of 3 million members, 140,000 volunteers and 35,000 employees. SAMARITAN INTERNATIONAL - L'Europa unita dai volontari soccorritori. Oltre all'Italia, prenderanno parte all'evento i giovani volontari del soccorso di associazioni di volontariato provenienti da Germania, Austria, Slovacchia, Francia, Lettonia, Lituania, Polonia e Ungheria facenti parte, come Anpas, di Samaritan International, una delle principali reti di associazioni di volontariato che in Europa si occupano di soccorso sanitario, protezione civile e solidarietà internazionale, con tre milioni di soci, 130.000 volontari e 30.000 dipendenti. Un impegno quello di Anpas in Europa che oggi porta i volontari delle 881 pubbliche assistenze sparse su tutto il territorio nazionale ad agire e coprogettare insieme ad altre reti, come Samaritan International, CEV e Alda, interventi di protezione civile europea, di soccorso e di cittadinanza attiva. Anpas - Sami Contest 2014 , Adria/Venice - Young Heroes Without Superpowers from andre@c on Vimeo.